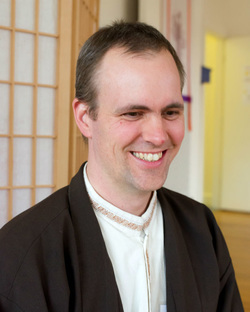 Michael Ciborski is a Mindfulness Dharma teacher in the Buddhist tradition of Venerable Thich Nhat Hanh. He was ordained as a monk for seven years at the Plum Village Monastery, France. Michael practiced mindfulness meditation and joined the monastic community to organize mindfulness retreats to lay practitioners around the world. An eloquent musician, Michael also studied several European and Asian voice training and chanting traditions and served as an English language chant master in the monastery. Michael Ciborski has been the Mindfulness Practice Community of Houston (MPCH) Dharma teacher for years, offering Dharma talks 4 times a year at our Sunday practice through Skype. Please check our calendar for upcoming Dharma Talks and retreats offered by Michael for the Houston Community.